League MVPs are now 0-8 in Super Bowls since 2000. White (away) jerseys in the Super Bowl are now 12-1 over the last 13 years. The #1 scoring defense has won all but one of the eight Super Bowl matchups with the #1 scoring offense in league history (Super Bowl XXIV). The Patriots are the first team ever to overcome a 16-point deficit in the playoffs in the fourth quarter. The Patriots are the first team ever to overcome a 19-point deficit in the playoffs in the fourth quarter (teams leading by 19 entering the fourth quarter in the playoffs were 93-0 before tonight). Tonight's 25 point comeback was the largest in Tom Brady's career, in Patriots history (both were 24 points), and in Super Bowl history (the previous record was 10 points). The Patriots are the first team to ever win the Super Bowl without holding the league in regulation. Tom Brady won a quarterback-record 5th Super Bowl (Charles Haley has 5 wins as well). Bill Belichick won his record 7th Super Bowl ring (5 as a head coach). Brady and Belichick have won 5 Super Bowls together, most ever for a quarterback/coach tandem. James White's 14 catches set the record for receptions by a running back in the Super Bowl. 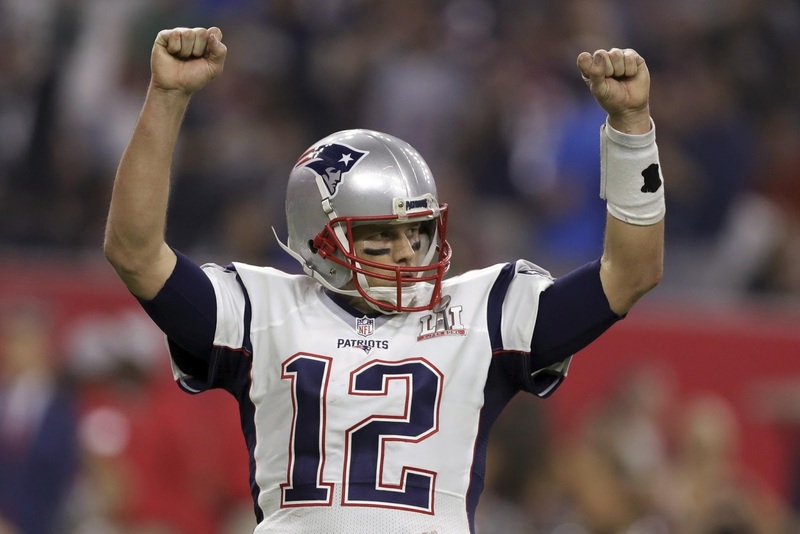 Tom Brady set the record for most passing attempts (62), yards (466) and completions (43) in a Super Bowl. Tonight was the Patriots' 9th Super Bowl appearance, an NFL record. With the win, the Pats move into second for franchise Super Bowl wins, behind only Pittsburgh, which has six. Tom Brady's 4 Super Bowl MVP awards are the most ever for any player. Brady aso set Super Bowl overtime records--with a 5-5 drive for 50 air yards, he's the first and only quarterback to attempt or complete a pass in OT. Tom Brady also extended some records he already held: he's now 207 for 309 with 2,071 yards and 15 TDs in Super Bowls alone. He's head and shoulders above the competition at this point. EDIT: Another one! James White also became the first player in NFL postseason history to record 10 catches, 100 receiving yards, and 2 rushing TDs. Well, there you have it. This Super Bowl was one of the most exciting of all time, and has to be one of the most emotional ever for Pats fans--Robert Kraft himself called it "unequivocally the sweetest" victory he's had. Let me know if there are any other records you found, and Go Pats!